How does Christianity translate into our friendships? Author Cherie Burbach offers the answer in today’s guest blog post. As you read, keep in mind those friendships you want to nurture, and remember the ones you want to begin too. But first, I want to announce the winner of last week’s give-away. Elizabeth Dent, congrats! You won a copy of Darlene Franklin’s latest release, Christmas Mail Order Angels. I’ll be contacting you soon to chat about the best way to get that to you. For those of you who didn’t win, don’t fret; you have a chance to win an equally awesome novel today! GIVE-AWAY ALERT! Cheri is giving away one free copy of her latest release, 100 Simple Ways to Have More Friends. A winner will be randomly selected from the comments and shipping is only available to those living in the continental US. One reason I like writing about relationships is because it’s universal. No matter who we are or where we come from, we all share a desire to be liked, to feel cared about, and be respected. We just want to get along. Despite the strife and arguments the world experiences, in the end we really do want peace. As Christians, it can be difficult to show our best to people. And yet, we must do this. A very wise friend of mine once said, “We’re called to love one another. Not like each other.” Loving is harder. It involves rising above pettiness and the exterior of someone’s personality and looking instead at that person the way God would. God doesn’t always agree with our choices but He loves us. We can do the same. We can simply open our hearts and move beyond the things we don’t agree with, leave judgement to God, and show love. Friendship is the first step to that. Cherie Burbach has written about relationships for over a decade at places like About.com, NBC/Universal, Match.com, Christianity Today, and more. 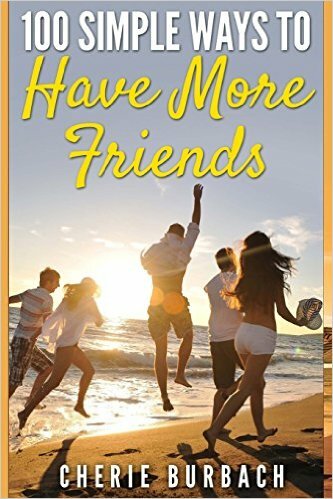 She’s penned 17 books, her latest of which is 100 Simple Ways to Have More Friends. Visit her website for more info, cherieburbach.com. Let’s talk about this. Lately, numerous women have told me they have a difficult time forming friendships and making connections with other women. I think there are numerous reasons for this (and for those who are local, I’ll be talking about this at an upcoming Moms group meeting in January), more than can be addressed in one blog post. But I do think forming and maintaining meaningful connections takes work, and perseverance. And it requires us to embrace risk, because reaching out can be scary. Do you feel you have meaningful connections, and if so, do you have tips to offer others who may not feel the same? If not, is there something you can do this week to connect with others? Also, look at your relationship history. 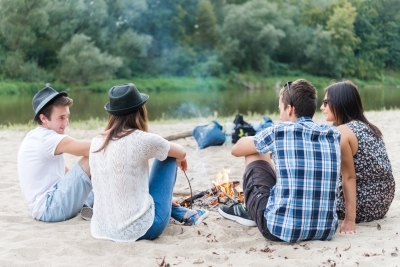 Do you tend to cycle through friendships or maintain relationships? How do you handle conflict when it arises? What do you do when a friend hurts you? Do you walk away or do the hard work to move past the hurt and deepen the relationships? Heavy subject, but an important one, I feel. Share your thoughts and experiences in the commends below, because we can all learn from one another! Have you ever been fuming mad at someone, only to find out you totally misread the conversation? In our world of rapid-fire communication, faulty perceptions, and misunderstandings, it’s easy to get our wires crossed. Sometimes this is funny. Other times it’s downright painful, and has the potential to destroy relationships and lead to bitterness. If not dealt with. What do you think of when you hear the word peace? What does it mean to “seek” and “pursue” it? Does this mean avoiding conflict? Holding our tongue? Is peace at all cost truly peace? In our effort to seek peace, are we smiling on the outside while our insides fester? And if so, how long before those bottled-in and swallowed-down emotions blow? I believe biblical peace runs deeper than a ceasing of war. Biblical peace speaks of wholeness, of restoring things to how they should be. Biblical peace implies authentic conflict resolution. Honesty, not superficiality. Speaking the truth in love and getting to the root of the issue. When deep hurt has occurred, this may take time. We may even need a third party to help us out. Other times, we may find that what we thought was an issue wasn’t really an issue after all. A few days ago, I received an email from someone I had hurt. Twice. I hadn’t intended to hurt them, wasn’t even aware I had … until I read the email. We realized it was a misunderstanding–a misreading between the lines. The person felt silly for sending me the email, but I was so glad she did. Had she not, her hurt would’ve remained, creating disunity. By honestly expressing her feelings, she gave me the opportunity to apologize–and explain. Afterward, my daughter, her friend, and I had a lengthy conversation on communication errors, and they shared with me similar stories. Times when someone they cared about hurt them deeply–unintentionally. Only many times, they hadn’t gotten to the truth until weeks or months later–after weeks of hurt, of disunity. We decided it’s best to communicate openly *before* forming our conclusions, giving the “offending” party the benefit of the doubt. We decided to “seek peace.” The kind of peace that holds tight to relationships, seeking restoration and intimacy. It is so easy to read between the lines, to assign feelings, judgments, and conclusions to words and actions. But what if our interpretations are wrong? Let’s talk about this. When have you unwittingly caused someone pain? When have you been hurt by someone else, only to find out you assigned faulty meaning to their words and actions? How can we avoid this communication jumbling? 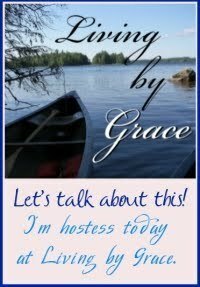 Join us at Living by Grace as we talk about speaking the truth in love in order to seek biblical peace–a peace that leads to relationship-restoration and increased intimacy. This morning I received an email that came across the American Christian Fiction Writers‘ loop asking for help for a particular scene. Basically, information needed to be conveyed, but the author didn’t want to comatose her readers in the process. I’ve seen this happen time and time again. A passage, sometimes even an entire chapter, will be jam-packed with one eye-blurring detail after another without even the hint of conflict. It’s a self-defeating situation, really. The information, as important as the author thought it was, is ignored. If the reader is anything like me, they’ll graze through the monotonous, skimming ahead until they get to the good stuff–the drama. About a week ago I critiqued a romance story. It was your typical girl meets boy, girl likes boy, boy likes girl plot. It was a lovely Hallmark scenario full of sunshine, flowers, picnics, and plans for romantic dates. And it bored me to tears! So I put my computer down and escaped to my basement for a run before completing the rest of my to-do list. Which would bore you to tears should I record it here. Unless I shared just a smidgeon of all the inner turmoil that occurred while doing the mundane. Either I am the only emotional wreck out there, or we are all plagued by our inner demons. We live in a sinful world, after all. And life is full of conflict. In that hour alone while I stared at the cement wall, the belt spinning beneath my steadily pounding feet, my mind raged. As I watched the miles slowly increase, I thought about all the things I had to get done. This opened the door for false expectations, both of myself and others. Then of course, there was the gentle tug of the Holy Spirit calling me to surrender, to fight against my anxious, fretting, sinful nature so I could rest in His grace. As you can see, my potentially boring run was filled with emotional conflict. Think about your typical day. The phone rings. You glance at the caller ID. It’s your best friend. You want to answer it, but you have a long list of things to get done before your husband gets home. Perhaps painful memories surface–of when your husband pushed you aside, or of a time when you’re friend let you down when you needed her most. Or maybe it’s dinner time. You’ve cooked steak because it’s your husband’s favorite, but as you eat, your eyes drift to your steadily expanding stomach and insecurities surface. As your mind dwells on the ten pounds you’ve gained over the past year, your perception becomes twisted. Is your husband staring at you? Does he think you eat to much? So you react, only your husband wasn’t thinking of you at all. He was deep in his own world of inner demons and insecurities. And viola’! You have conflict. Everything we do is tainted by the baggage we carry. The same is true for our characters. The next time a boring scene threatens, dig deeper. Remind yourself of your character’s inner demons and insecurities. How would those demons rear their ugly heads in the current situation. That doesn’t necessarily mean your characters will throw a fit. Perhaps they will hide behind a painted smile, but their mind will rage. Because the human mind always does. And if you don’t know your character’s inner demons and reality-distorting insecurities, then set your computer aside until you do. Confused? Maybe this article will help: Conflict found on “Learn the Elements of a Novel” website.